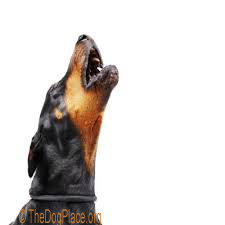 Before scolding your dog for barking, learn how to train him WHEN to bark a warning and how to best communicate with the human pack. 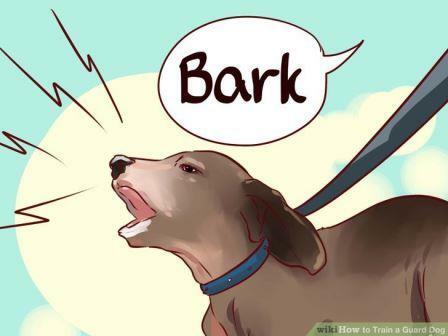 How to stop your dog from barking? First you need to understand his language as well as he knows yours, then you can teach him anything because no animal wants to learn more than your dog! It was more than 10,000 years ago that dogs started to become domesticated. Some say that early "dogs" could smell the caveman's stored food so they started hanging around the cave entrance. The cave dwellers found out that these animals could be good alarm systems, barking to warn them of marauding enemies or other wild animals, they would leave scraps of food outside for what became our furry friends of today. Thus devotion to mankind has been passed from mother to pups from that day to this. Most of the wild has of course been bred out of our domestic dogs but there are still remnants that we will have fun learning about. Did you know that most wild canines, i.e., foxes, wolves, and coyotes bark very little? Interestingly, their puppies bark a lot. Barking is a puppy trait. Here is insight to the domestic dog - he is always a cub, a puppy. In a continual type of adolescence if you would. Forever young! What a wonderful thought. What you have to remember before you shout "shut up" to your adolescent, is that they are really trying to talk, trying to tell you something, that at that moment, they think is important. Now as the adult, it is up to you to listen, and then figure out what they are saying. They are instinctively protective and remember, we "hired" them to alert us to unusual things. So barking is often of a protective nature, for example, "There is this weird guy walking up to our door." Dogs alert us to good things too like "Oh boy, oh boy, daddy's home." So before you get annoyed, stop and think what the dog is trying to tell you and then as you might do with a small child, acknowledge his message and thank him for letting you know. Sometimes a bark is for help. "Baby Sally is out of the yard!!" Or just a plain, "I love you - pay me some attention." Whatever the circumstances, barking is the only way that your dog can speak to you. Dogs bark to warn us of danger, because they are confused or frightened, or just like small children, they bark to get our attention. And one thing is for sure, the more you yell at them to stop, the more they want to bark. You have just established a cool way of communicating with them, and they want to continue it. Now if it were only so easy with our human teenagers! So, if you want your dog to stop barking about whatever it is, acknowledge his communication and then, depending on the reason he barked, respond accordingly. If it was about something outside that does not concern you, keeping your voice low but firm, say, "NO." Your dog may be disappointed that you don't want to converse with him but he will see that you have checked it out and he will get the message that there was no cause for alarm. If you emote the correct body language, he will quickly learn to only bark when it is important. If it turns out to be someone at the door or some unusual occurrence in the neighborhood, thank him politely but don't praise him. If he continues to bark after you have determined its okay, tell him "NO" and walk away. For those of you who have dogs that think they are protecting the house from any and all delivery people, the way to train (or retrain) is to show that you approve of that routine delivery person. Acknowledge their arrival with an easy attitude and tell the dog "it's okay". If he barks after you have shown him that this is a routine thing, then by all means, scold him and firmly say, "NO." Okay this is advice based on your dog being inside. If he is an "outside dog" then it becomes much more difficult for you and for your neighbors. If he is outside, you will be at best, inconsistent in re-educating him. The solution is to buy a crate, select a room such as study, living room, or kitchen and put the dog in the crate. Teach him by talking to him as you go about daily chores. When he barks, let him see you "check it out" and then tell him it is ok. Do not let him train you to jump up and respond to his bark command... If he ignores your "NO, its okay" command, use the vinegar-water-squirt-bottle correction. DOES THE TAIL WAG THE DOG? No, not really but at times you would think so. When dogs bark, it has meaning, and so do those wonderful wagging tails. There is a whole language in the dog's tail and how it is used and we need to take the time to understand. In the wild, the position of the tail, and how the animal uses it is important communication to the rest of the pack and even to other species. Tail carriage can determine whether or not the animal is accepted into the pack, allowed to eat, protected, or mated with. Even though the tail is an extension of the spine, used for balance and beauty, it also is like a personal telephone. Think of it this way, like barking, the tail communicates many different moods things in just a "wag of the tail." Now if you take the time to notice, dogs only wag their tails at other animals, of which he considers you one. Have you ever seen a dog wag his tail at the TV? Or the coffee table? No of course not. And when he wags his tail at the couch, he is communicating with YOU! "Can I get up there too?" There are several types of tail wagging. It is really helpful to dog owners if they can understand what the dog is saying to you. The way he wags his tail can tell you the mood of the moment, and let you be on alert as to the frame of mind of your furry friend. His wonderful tail can say; "I am interested in that, I am challenging that, I will dominate that, I feel very confident right now, I am relaxing now, I am scared right now and feel threatened, I am confused and don't know what you want me to do, or, I will protect you now and show aggression towards any threat." If your dog holds his tail mostly horizontal in a relaxed way, it usually is saying that he is curious about his surroundings. He is not particularly feeling aggressive, protective, or challenging yet. 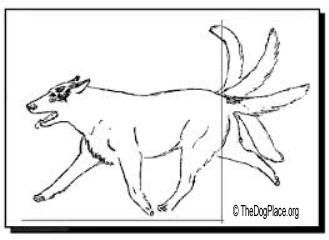 Now if you see that horizontal tail become stiff, make sure YOU are in control, the dog is getting ready to either challenge another animal or person for being in their territory, or he is getting ready to become very defensive. If your wonderful little communicator walks around with his tail held high, but not stiff or curled over his back, he is telling all who can see, that HE is top dog in the area. I am confident, and I am in not only control of myself, but my area also. If your furry friend puts his tail between his legs, he is begging not to be harmed either by you, the circumstances or another dog. It is a way of saying, " Please don't hurt me, I will submit to your wishes," or "Please don't abuse me any more." This is also a universal way of a dog entering a pack by saying, "I want to enter this pack so please don't hurt me. I am willing to be submissive to the Alpha dogs." A tail that the dog holds lowered but in a relaxed way says just that; they are relaxed and just waiting to see what the conditions of the time revel. If you have ever seen a dog whose tail becomes suddenly bushy, you know to watch out, because your dog is becoming aggressive, ready to either attack or defend. This is a sure sign that YOU are the one that will have to control the situation. Also, if the tail is held high, stiff, and wagging a mile a minute, be alert to the situation. This is another sign of aggression. If your dog has a lowered tail, one that is relaxed, and moving slowly from side to side, it means that they are relaxed and feel comfortable in the surroundings. I once had a wonderful black Lab that would wag his tail in circles when he was happy. A wagging tail means a friendly dog. As you can see, that is not always the case. You have to always be alert when you approach a dog you haven't met before. Just because you love dogs, doesn't mean that the dog knows that right away. If a strange dog approaches you, smile, act glad to see him, say "hello handsome dog" with the steadiest, friendliest voice you have. Make no attempt to pet the dog unless his tail is wagging and he is smiling, yes dog do smile. If he makes eye contact he is not at all submissive as you approach each other, put your hands in your pocket and just keep walking normally with no hesitation. He should allow you to pass with no challenge. It you meet a dog with the owner and they both seem friendly, ask if you can pet the dog and if the answer is, "Yes," then put your hand slowly out palm up. The reason for palm up is that dogs have come to associate palm down with either petting or hitting. You don't know which is the case for a strange dog but palm up is normally associated with the giving of food. Do this only if the dog is giving off friendly body language signals. If not, say hello and keep walking because some owners can't read their own dog! If all seems well, extend your hand slowly toward the dog, allow him to smell your hand for a few seconds and be observant of his reaction. Then, if invited, pet the dog with a GENTLE hand, lowered voice and a smile. There are so many ways our dogs try to TALK to us. They learn to understand us when we speak to them, because they love us and want to please. If you love your dog, and want to please him, then learn to understand HIS language. Neighbors complaining, get rid of him or get a solution! Instill watchdog response with this command.